Good news! I've heard that ezbuy has recently introduced two new giant e-commerce sites into their long list of e-commerce partners. They are JD.com and mogujie.com, both are huge in the Chinese market. I believe we Malaysians do quite like shopping on platforms originated from China, who can blame you, the things are cheap. Unfortunately, I'm one of those people in the category of knowing about these awesome e-commerce sites but can't fully enjoy it due to language barrier since my Chinese language is quite poor. Though, thanks to ezbuy, it's possible now! 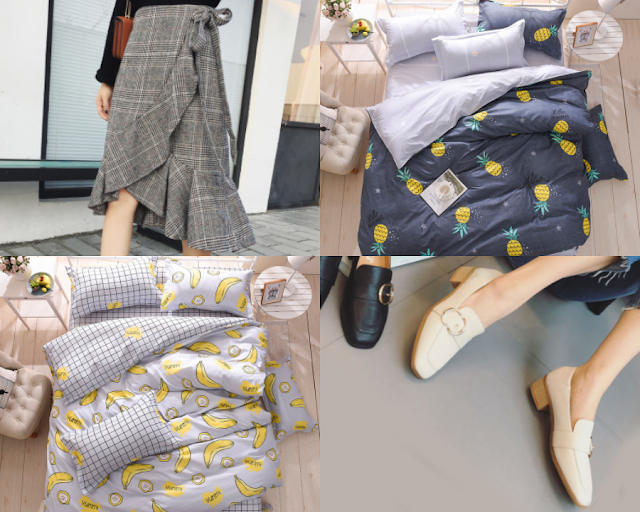 Before I get into why I think ezbuy is a convenient shopping platform, let me talk a little bit about the two new sites mentioned earlier. JD.com is also known as Jing Dong, another leading e-commerce site in China. JD.com is famous for their quality of products, fast delivery, authenticity of products, and their great customer service. Having to go through their website, they have quite a lot of items there, from clothings to household, gadgets, and many more. Almost anything you can think off. Since I've became a wife, I've been keeping a lookout for stuffs for my home. Things that can make my life easier or just things that are useful in general. 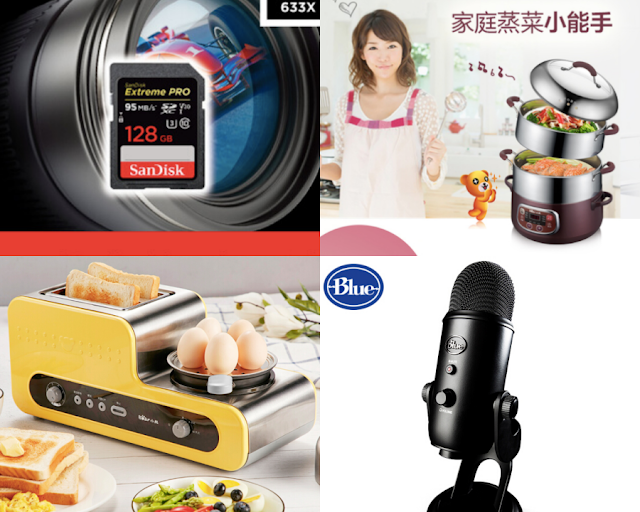 As mentioned, JD.com has great gadget options and kitchen electrical appliances are not excluded. From the the home page itself, they've displayed so many cool looking electrical kitchen appliances. The other two things I've selected are work related. I'm currently doing a lot of vlogging, video recording, and shooting, thus having an extra memory card with a huge gb and a good quality Yeti mic will be extremely helpful. 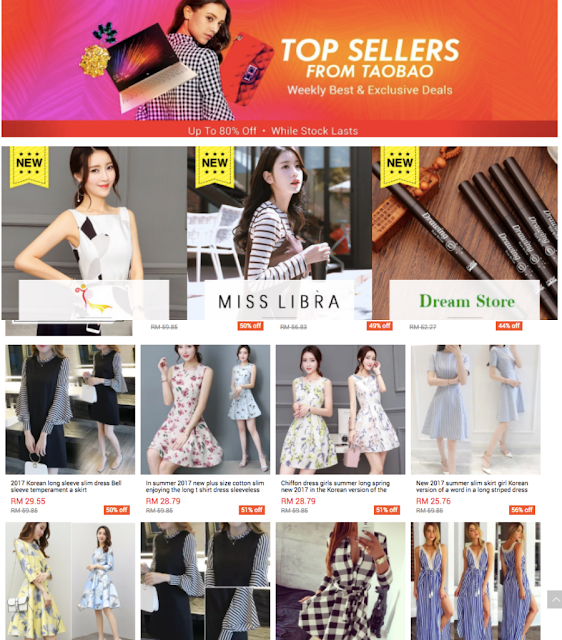 You can easily identify this site as one that focuses on female user/customers because on its main page, it promotes mostly fashion items. 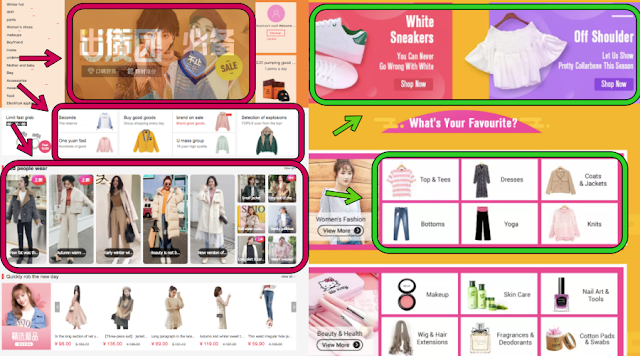 After doing some research, this e-commerce site is known as the Pinterest of China, where it blends social network with online shopping. On the main website, I'm not sure how the social networking works but it's said that they have an app called Mogu, where you'll be able to get the full social mix e-commerce experience. Scrolling through the website, of course, I have to find myself a pair of cool oxford looking shoes. The white/beige one is perfect plus it has heels. The skirts I really like too as it is a wrap skirt style where you don't have to worry about not fitting into them ever. Plus, this is skirt design is really trendy these days. Other than fashion, they do also sell makeup and a couple of house stuff. I'm trying to avoid buying makeup because I already have so much of it. So, I've decided to check out their bedding section. I've been obsessed with super quirky bedding sets such as the two designs shown above. It's pineapples and bananas! So Cute! I love how they are not all from just one piece of cloth, they add more character to them. To be honest, I really don't have to say much about this site. Everybody knows Taobao, so don't even get me started on what I want from Taobao. We'll move on. 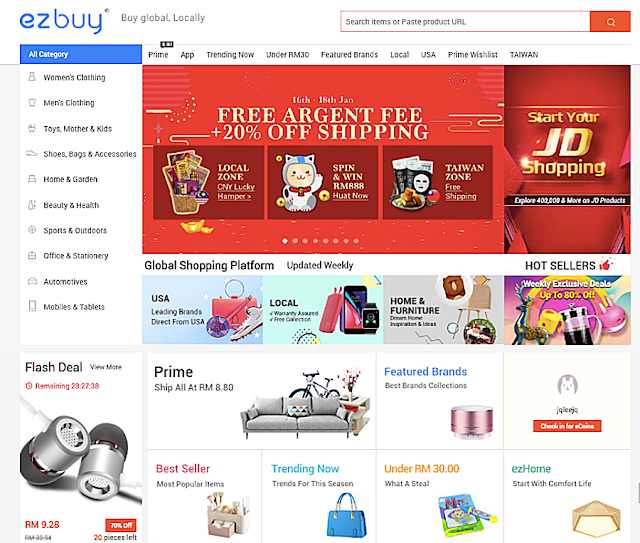 After the long intro, let's get down to the few reasons why I think ezbuy is a convenient online shopping platform. One major point is the language of the site itself. 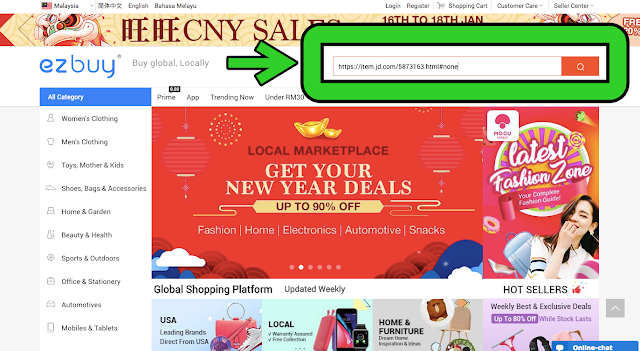 JD.com, mogujie.com, and Taobao, although they are awesome shopping platforms, the issue is that they are all in Chinese. For someone like me who knows a little bit of Mandarine can be tough, what more for an individual who is a complete banana. Yes, we do have google translate but they are not 100% accurate especially when you are looking for something with a different technical terms. Plus, as shown in picture above, glitch often happens when you translate the entire page. Thankfully, to be able to shop JD.com, mogujie.com, and Taobao items on ezbuy is definitely something I'm thankful for. At least I'll know what exactly I'm buying because ezbuy is a Malaysian site accommodates three different languages, English, BM, and Chinese. Even if you can browse through a Chinese site like a pro, sometimes the different currency can be a bit of a hassle as you'll have to constantly pull aside to calculate how much are they in Malaysian Ringgit so you won't go over budget. If you buy JD and mogujie items through ezbuy, you'll get the exact price in RM that you'll need to pay. What if you've stumbled upon something you like on JD or mogujie but not sure if they have it in ezbuy, well, I have a neat trick. 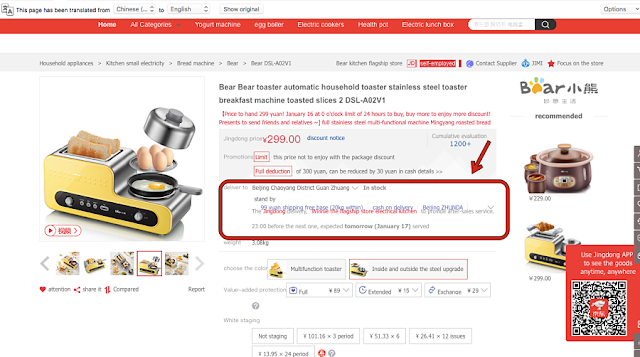 Just copy the link JD or mogujie and paste them on ezbuy's search column (picture as shown above), they'll direct you to the exact item that you want from respective sites on ezbuy. I've tried this a few times and pretty much all of them worked, thus, I'll conclude that most of the items from JD and mogujie are available for purchase on ezbuy. So magical! One thing I realise is that when I visited mogujie website directly, a lot of the styles that they heavily promote are very much for the winter season because it's winter in their country now. To me, as much as they looked good, I won't buy them because I won't be able to use it in Malaysia. 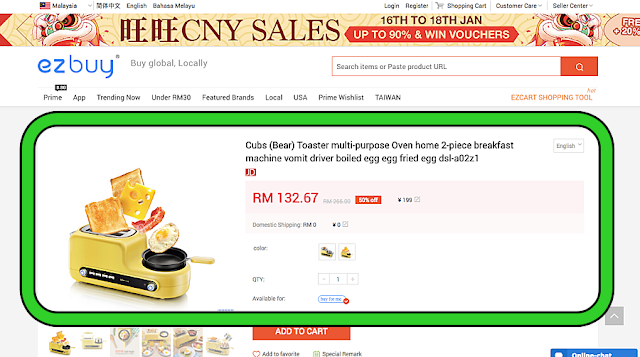 However, if you check out mogujie on ezbuy site, you'll realise that their recommendations and items on the main page are very much catered to suit our Malaysian needs. It's fantastic! They are selling the same items but the recommendations are well catered to what's relevant to the locals. By registering for an ezbuy account now, you are entitled to a RM15 cash off voucher along with a 15% shipping fee discount. 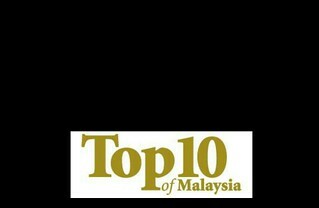 You are also automatically be in the running for the RM500 ezbuy cash voucher, which will be credited into you account. Contest ends on the 19th February 2018. P/s: To be entitled for the contest, you MUST register through the link above.